Yes we have made it to day 100 with a different species in flower every day. Can we do the next 265? 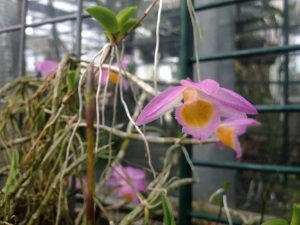 The honour of day 100 goes to a small growing Dendrobium species from Laos, Vietnam and Southern China. Dendrobium loddigesii is largely deciduous growing 10cm pseudobulbs in the summer which then drop their leaves in the winter. Flowers appear from the leafless bulbs in late spring. We find that this species needs a distinct summer and winter to flower well as it can tend to just keep growing if kept warm all year and forget to flower. We grow the species bright, wet and warm in the summer – Warm Americas seems to suit it best. Then cooler and dryer in the winter when the roof of Cool Americas seems to be its favourite spot. This may seem like a bit of a faff but it is definitely worth it for the sweet little flowers appear in April.